Our house has a spare bedroom which doubles up as an office for Laurie and a place for friends to sleep when they stay over. It was previously decorated by the one-style-suits-all decorating genius who coated our entire house in magnolia paint before fitting reams and reams of brown carpet. I decided to decorate the room for Laurie’s Christmas present, in the hope he might use it more often. It now has a nifty fold down desk, and very bright yellow walls. The yellow is a lot brighter than I had imagined, and can be a little blinding on particularly sunny days (because it feels as though you are In The Sun). I painted it yellow because we stayed in Edinburgh in a quirky little flat with wooden floorboards, yellow walls and hundreds of books. It was a really lovely flat, so I used it as my inspiration when decorating the room. The room was in need of a few extra finishing touches to try and tone down the walls a little, and I still haven’t got round to sorting out a lot of these. So, for Father’s Day, I thought we might try to make the little more homely for him. The great thing about being Laurie is that he has a very lovely wife who takes hundreds and hundreds of photos of him and his daughter (interestingly, there are about eight photos of me and Ebony, and I took them myself with a tripod). I decided to get a few of these photographs printed off to create a gallery wall in Laurie’s office. Truprint very kindly provided the photo prints for me, so I spent a good few hours uploading photos to their site and trying to decide which one should go in which frame. 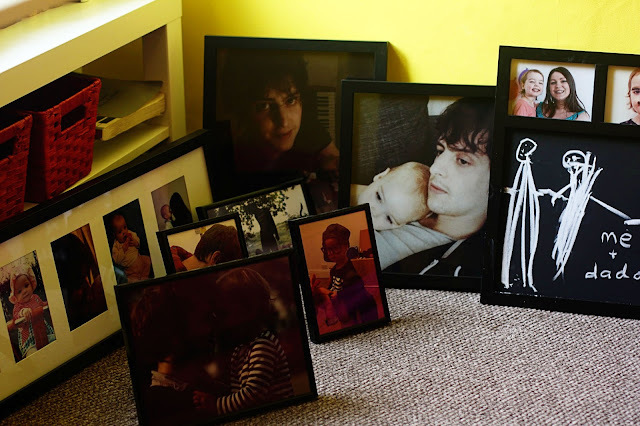 I decided to get the frames from Wilkos because I wanted all black and they had a good selection of sizes. I usually go with Ikea frames but didn’t really have time to go there and buy the frames before ordering the prints (and am not making the mistake of karting huge frames back home on the bus with me again). 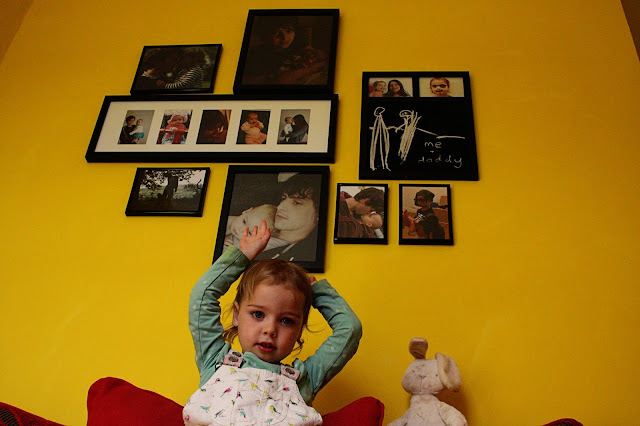 Once I’d chosen the frames I wanted to feature on the wall, it was time to choose which photos would go up. I wanted to choose some of Laurie’s favourites, as well as sticking up a few of my own. I also wanted to make sure that the photos reflected the whole of Ebony’s life, rather than just all being from a particular moment in time. I also wanted to put a feature up that wasn’t just a print. I was hoping to find a ‘L’ that could go on the wall, but in the end settled for a blackboard. 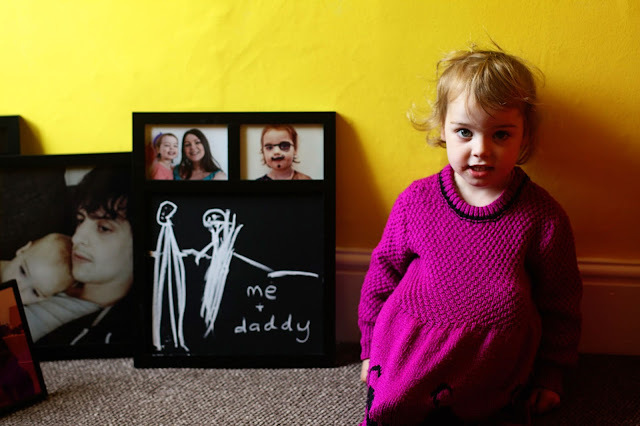 I got Ebony to draw a picture on the blackboard so I’m sure Laurie will love it. Once I’d decided which prints to get, I placed my order. It only took a couple of days for all of the photographs to arrive. 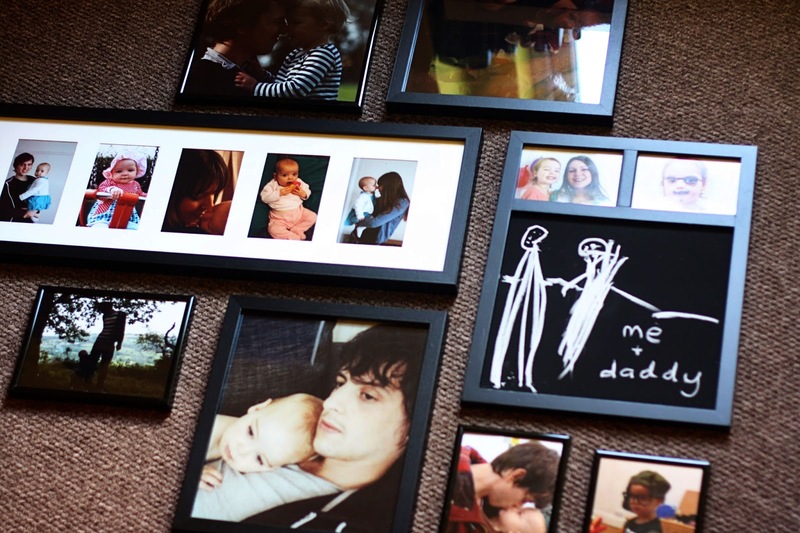 We spent some time putting the photos in the frames, and then tried varying layouts on the floor to see what looked best. If I’m honest, this took ages. We kept trying new layouts only to decide something still wasn’t quite right, but in the end we got there. Then it was time for the hard put, putting it up on the wall. One of the frames I’d chosen was quite long, meaning it would be pretty obvious if it wasn’t hung straight. I had to get a spirit level out and, erm, there might be a few extra holes in the wall behind that frame. I’m really pleased with how it looks. It’s definitely worked at toning down the walls simply because it draws the eye and takes your mind away from All The Yellow. It’s not a huge gallery wall because I figured it would be something we’d want to add to over time. I hope that every six months or so we’ll pick out a new favourite photo to add to the collection. The only thing I do regret is that at one point Ebony said, “I don’t want you to hammer me,” in a way that made me question all of the parenting choices I have made to date. Do I really seem like the sort of mother who might randomly start hammering people? Offer is valid until midnight 15th June 2015. Offer is valid for single use during the promotional period and to customers residing in the UK on Truprint.co.uk only. Offer cannot be used in conjunction with any other offer or on pre-paid prints. Please allow an additional 1-2 delivery days during this promotional period.